Motus is a young goblin who must undertake his biggest challenge ever, that of passing through the forest outside his home, a feat no other goblin has ever accomplished. Join him on his journey as it is available to download now on Xbox One, PS4 and Steam right now! 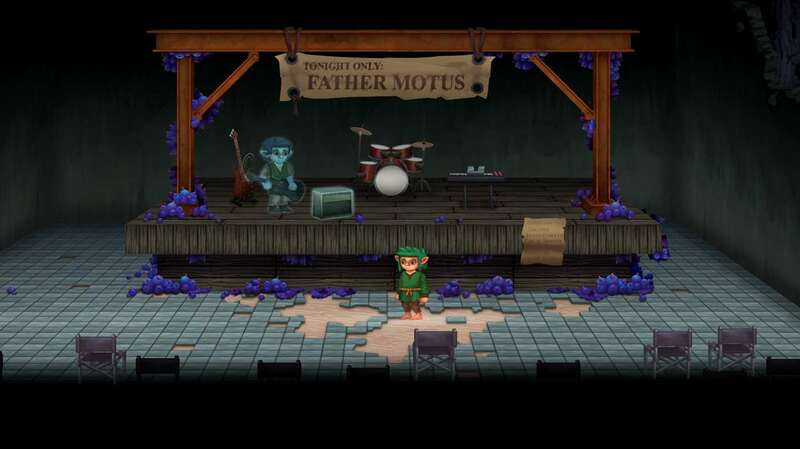 The Path of Motus is a 2D platformer with a deep narrative as players take the role of Motus, developing from a child into a young man, overcoming many obstacles on the way. Expect to hear stories from Motus’ past involving his band, his first job and his first love. Just don’t expect them all to be the happiest stories. The game is a very personal experience from developer Michael Hicks and involves a lot of his own experience regurgitated for The Path of Motus. Also included are some novel combat scenarios; rather than simply stomping on enemies’ heads, Motus will instead use words to defeat opponents. Buttons X, Y and B all correspond to a specific word and players will need to match their words to those of their enemies in both attack and defence. Failing that, the game even includes a pacifist mode where all combat can be avoiding. This is called taking the ‘High Road’ and for Motus is the preferred way to get through the forest. The Path of Motus is available right now priced at £12.49. Those gamers looking for a strong narrative in a 2D platformer – an unusual combination – will find this game perfect for them. Anyone with an interest in storytelling though will take away a lot from this adventure though. Let us know in the comments below if that’s you! Our review is well worth a read if you are still undecided, whilst those looking for even more depth should check out our interview with the developer. Will you let other people stop you from pursuing your dreams? For generations, a village of goblins has been trapped inside a mysterious forest; anyone who attempts to leave returns hopeless and defeated. Determined to break new ground, a young goblin named Motus plans to build a series of bridges through the forest. However, his perseverance will soon be tested, as he meets bullies that use their own words to stop him. Will you find a way through life’s forest, or like others be lost in its depths with no will to continue? Developed for three years by Michael Hicks (design, music, programming, writing) and Goncalo Antunes (all art and animations), The Path of Motus weaves gameplay and story together to deliver a poetic experience unlike anything before it. 10% of all purchases will be donated to The Cybersmile Foundation, an award winning non-profit that helps thousands of bullying victims each year through their support lines. Please visit http://pathofmotus.com to learn more and find resources for pursuing your own dreams. Featured Gameplay: – Verbal Combat: Motus meets bullies that yell a variety of deadly words; you’ll need to tactfully use your own words to deal with them. Will you use your words to inspire, or to destroy? – Bridge Building: There’s a reason why no one’s made it through the forest! Solve challenging bridge puzzles to build a way out. – Growing Up: Face unique challenges as Motus gradually grows from a child to an adult. Meet exciting new characters in each chapter of life and explore the deeper reasons for why they’re so aggressive towards others. – Thought Doors: Solve innovative puzzles that convey what Motus is feeling throughout the story. Unlike other story based games, the coolest moments in The Path of Motus come across nonverbally as you play.